Do your sales/proposal presentations seem to hit a brick wall? Are you committing Death by PowerPoint? Now updated through PowerPoint 2013! 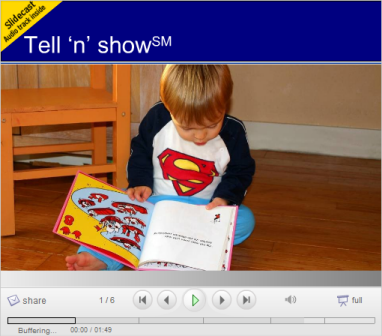 You can succeed with presentations! Basic principles for content development. Principles of design for non-designers. Delivery techniques that keep your audience glued in their seats. 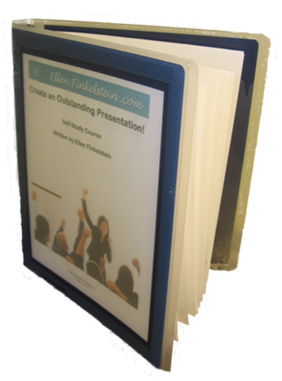 This self-study course contains over 50 pages of detailed content and will explain what you need to know to create and deliver outstanding presentations. Numerous exercises give you practice and hone your skills. I've been writing about and teaching PowerPoint and presenting skills since 1997. It wasn't always easy for me. My first attempts to design slides were ridiculed. My first speaking engagements were scary and not very successful. I had to learn and practice principles that I could apply to presenting. I'd like to pass these on to you. Microsoft has recognized my experisie with the PowerPoint MVP award; there are only 14 PowerPoint MVPs in the United States. This self-study course is for professionals who want to gain more business, get that promotion, or gain recognition in their profession. You should know the basics of PowerPoint (or other slide program) . 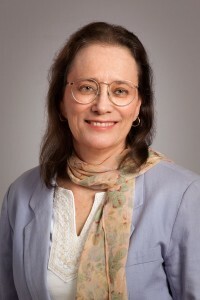 What's the structure of the self-study course? The self-study course contains 3 parts. The result will be a fully-developed short presentation. Part 1: All about content! You'll learn how to use your goal to drive the rest of your content, how to use the persuasive model, how to use copywriting principles to get the results you want, and how to use the Tell 'n' ShowSM method to communicate clearly. You'll learn to write an effective 7-8 minute speech, incorporating what you've learned. The 3 lessons in this part are Goals and Means, Write Your Script, and Storyboard and Gather Materials. Part 2: All about design! You'll learn techniques that anyone can use to communicate visually so that your audience clearly understands and remembers what you're saying. 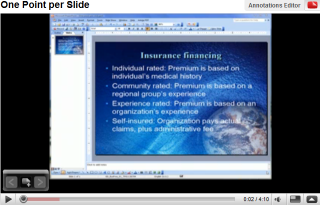 (You can use any presentation software that you have.) The 4 lessons are Start Your Presentation File, Format the Slide Master and Your Color Scheme, Add Some Design, and Add Visuals. The Add Visuals lesson covers images, diagrams, graphs, layout, and hyperlinks. Part 3: All about delivery! You'll learn how to have a conversation with your audience, rather than talk to them, as well as techniques to polish your speaking. The 3 lessons in this part are Practice, Deliver, and Ask for Feedback. What do you need from your side? You'll need an existing presentation or the outline of one you want to give. You'll also need PowerPoint or other presentation software that you know how to use. This self-study course is not theoretical; you'll end up out with a real presentation that you know how to deliver successfully. You'll get the following free bonuses when you purchase. Bonus 1: My e-book, 101 Tips Every PowerPoint User Should Know. I sell it for $19.97. Bonus 2: My e-book, 7 Steps to Great Images. I sell it for $6.97. Bonus 3: My video: "One Point Per Slide"
Bonus 5: My e-book, The Lost Art of Persuasion. I sell it for $9.97. 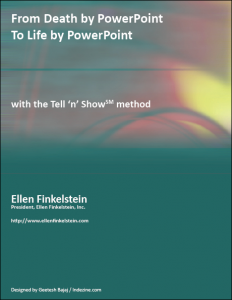 Bonus 6: My white paper: "From Death by PowerPoint to Life by PowerPoint with the Tell 'n' ShowSM method. Bonus 7: E-mail me 3 times while you study to ask me questions and I'll give you answers! Disclosure: I sometimes recommend products using an affiliate link.